With this service release, we provide a fix for a security vulnerability. If you’re running Acrolinx on a Windows OS, you need to update to 5.3.2. Possible directory traversal on Windows-based systems - CVE-2018-7719. For more information you can view the public entry: http://cve.mitre.org/cgi-bin/cvename.cgi?name=CVE-2018-7719. With this service release, we provide a better handling of elements that are specified as ‘empty’ in Content Profiles. Acrolinx reads, but doesn’t check elements that are set as 'empty' in Content Profiles. Sometimes Acrolinx got a little overenthusiastic and checked these empty elements too. This could cause some trouble when checking content with a lot of empty elements, like in Darwin Information Typing Architecture (DITA). Now, Acrolinx is still enthusiastic about checking content, but won’t check empty elements anymore. "An error has occurred in the script on this page." You'd see this message if you switched from the Results tab to another area in the Sidebar. This wasn’t helpful and Acrolinx worked fine. So, we turned off this message in the Sidebar. For troubleshooting issues, you can refer to the integration log files. The request validator played hide and seek with you and wouldn’t show some file names of the checked content. This happened when "=" was part of the file name. We fixed this issue, now you can troubleshoot with the request validator as you’re used to. This is a major release - with extended Markdown support, which is just the icing on the cake. In 5.3, we serve you a richer and bigger Acrolinx Analytics. The cherry on top is our new Content Profiles feature, which let you do all your server-side segmentation in the Dashboard interface. Acrolinx Sidebar version 14.5 is available when you connect to the new 5.3 Acrolinx server. For more details, open the Sidebar release notes here. If you have a large reporting database, a migration to this server version from an earlier server version could take some time. For 5.3, we’ve made Analytics even better since it’s such an essential part of your governance. We added some new charts and no less than 3 new dashboards; Category Scores, Server Monitor, and Quality Snapshot. On top of that we’ve improved filtering and performance, and the overall look and feel. Often you want to look behind the Acrolinx Score and figure out what your particular challenges are. Is it spelling or voice? The new Category Scores dashboard answers this question. The Quality Snapshot dashboard gives you a very quick overview of your Acrolinx Score. The Server Monitor dashboard helps you to scale your environment and shows the load on your system. The Business Value dashboard got new Content and Clarity Improvement charts to see whether you make the most out of your system. On the Content Quality dashboard, we’re now showing the average category scores of all Content Groups. We’ve removed the tables of documents with the highest and lowest Acrolinx Score. Our Analytics Dashboards now offer an easy way to filter based on your custom fields. To filter based on your custom fields, use 'Filter by Field', which you’ll find on the right side of every relevant dashboard. You can now define a target individually for each Content Group. You can track the target score in the new Content Group Performance chart and the Content Group Overview table in the Content Quality dashboard. We’ve added the option to prevent checks that don’t fall into a Content Group. You can do this in Analytics > Administration > Content Groups . We’ve renamed 'benchmark' to 'baseline' because that’s the standard industry term. When setting the baseline period, Acrolinx now shows how many checks are in that baseline period. You’ll see this immediately and it can help you decide whether the period you’ve selected makes sense or not. We’ve updated your Acrolinx Analytics component to JReport 14.5 Update 1. Great news for German speakers, we’ve translated all Analytics Dashboards into German. 'Verständlichkeit' and 'Clarity' were separate issue categories in the reporting database. We’ve changed how the reporting database works, so that Clarity issues in all languages are now one category (Clarity). Acrolinx migrates your old reporting data automatically. Your Guidance Package comes with a directory for custom Analytics Dashboards. This directory got a new name so from now on, you’ll find these dashboards in Root > Public Reports > AcrolinxReports > custom . We stored absolute URLs for Scorecards, including the domain name in the Acrolinx reporting database. We now store relative Scorecard URLs, which means that you can open Scorecards even when your domain name changes. To make loading the Guidance Overview dashboard faster, we now only load 1 month of data. You can change the start time in the 'Enter Parameter Values' dialog if you want to see more data. Over time, the reporting database can get very large. That’s why we added the option to automatically delete old reporting data, for example, all data that’s older than 3 years. You can configure this in coreserver.properties , for more information see Reporting Database Essentials . We’ve added a new feature to the Acrolinx Dashboard, called Content Profiles, that let you configure how Acrolinx reads your content. Up until and including Acrolinx Server version 5.2, you could configure server-side segmentation with what we called CSDs and Context Definitions. But you had to manage these files manually. 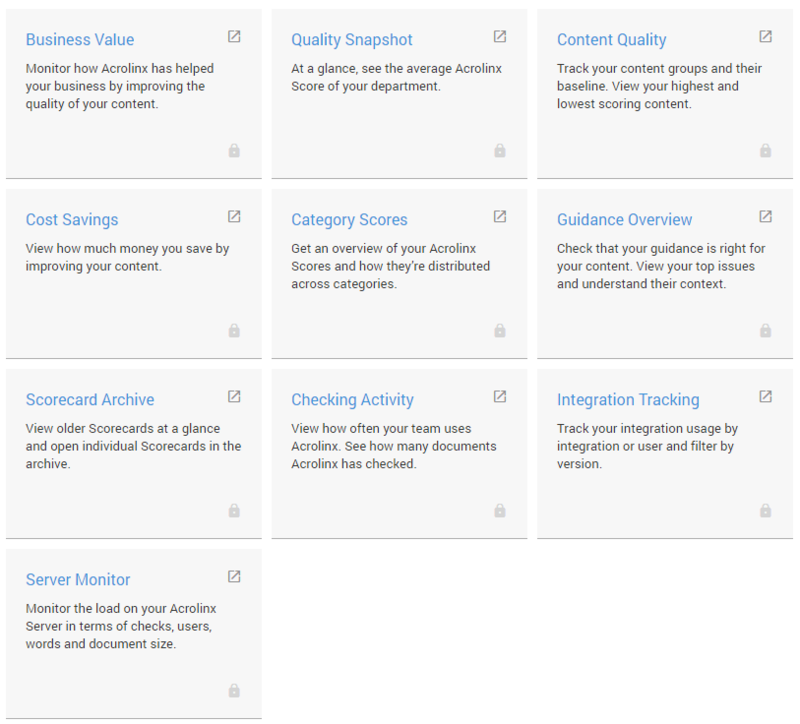 In Acrolinx Server version 5.3, we've replaced all of that with Content Profiles. You'll find Content Profiles under Guidance Settings in the Dashboard. In a Content Profile, you can tell Acrolinx exactly how you want it to read your HTML or DITA-XML content. You can even specify a Content Profile for how you want Acrolinx to read your Microsoft PowerPoint content. And all of this with a user interface, so you don’t have to worry about managing any files. As part of your update delivery of Acrolinx 5.3, we'll migrate your Classic edition extraction settings to Content Profiles to work with the Sidebar edition. We’ve improved our Markdown support to include HTML entities, tables, and bulleted lists inside a blockquote. For example, Acrolinx now recognizes HTML entities like '&' in Markdown text and in HTML element attributes inside Markdown code. Acrolinx had a little trouble with empty lines in a code block. We’ve fixed this, so that you can now use empty lines even within code blocks. Acrolinx now recognizes YFM as a context in Markdown. Acrolinx will check 'Acrolinx Website'. Once upon a time we renamed checking score to Acrolinx Score. And now, for consistency, we’ve removed checking status from the Scorecard. To live happily ever after, we encourage you to migrate to the Acrolinx Score if you’re still using the checking score. To simplify the server settings, we’ve removed the httpDocBase ' and ' outputPath ' configuration options. If you’ve used these options before, please make sure that your setup can handle the new default behavior. We used to give you the option to deactivate the reporting database. But because Acrolinx Server 5.2 and later need a reporting database, we’ve removed the core server option reportingDatabase.enable . This means that you can’t deactivate the reporting database anymore. We’ve never supported restoring reporting database backups from older schema versions to newer schema versions. This is because your data can get corrupted. You’ll now see a message warning you that you tried to restore a reporting database backup from an older database schema version. To learn more about database backups and see Analytics and Reporting Database Backups . Now, only the super administrator has the power to change roles and make another user a super administrator. With great power comes great responsibility. Sometimes, you need resources like Scorecards, images and data backups to be accessible without authentication. This is why we’ve extended the setting privacy.secureReportDownloads . Now, not only Scorecards, but all resources can be downloaded without authentication. When installing a new Acrolinx Platform, we still used some old terminology to create the default roles. We’ve now renamed 'Linguistic Administrator' to 'Guidance Administrator' and removed 'Rules Administrator'. Previously, Acrolinx couldn't check PDF files with an owner password. You can now check PDFs with an owner password but keep in mind that you still can’t check PDFs with a document open password. When proposing a German term suggestion for an unsuitable plural word, the preferred suggestion would’ve been singular. We’ve corrected this, and now Acrolinx suggests the term in plural. For example, the term suggestion for 'Materialien' is now 'Stoffe' instead of 'Stoff'. The init scripts for Red Hat Enterprise Linux didn’t return an exit code when an error occurred. We’ve fixed this, so that now you get an exit code. There was a bug in EclipseLink where certain database passwords didn’t work with MySQL. We’ve upgraded EclipseLink to version 2.6.5 to fix this. See more information here . The Guidance Wizard couldn’t cope with large reporting databases. We’ve optimized the way the Guidance Wizard handles the data, so that it can cope with large reporting databases. Sometimes, hovering over issues in the STE Scorecard showed a jumble. We’ve fixed the formatting so that the STE Scorecard is now pretty again.